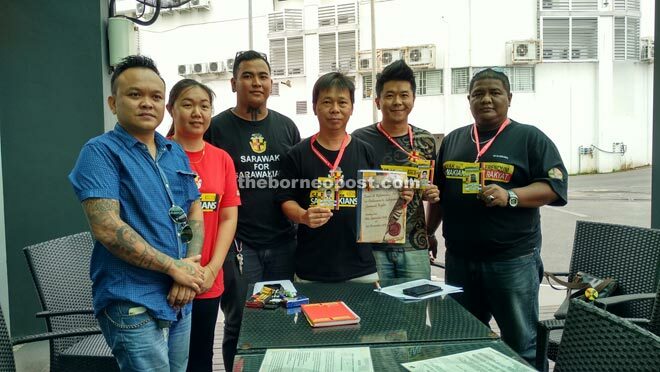 KUCHING: A petition conducted by Sarawak for Sarawakians (S4S) proposing for full autonomy has so far received 30,000 signatures from across the state. Person-in-charge of the S4S south, central and north zones, KC Tan, told a press conference yesterday that the response towards the petition was very encouraging since it was launched on Sept 16. “Honestly, the response is very positive and we collected over 300 signatures on the launch day itself. “Bumiputeras account for 55 per cent of the supporters and the rest are Chinese,” he added. The statewide three-month long petition drive targets to collect 300,000 signatures by Dec 31. The objective of the petition is to seek an enactment of a Referendum Ordinance to protect the rights of Sarawak and wants the Federal Government to honour the Malaysia Agreement signed on Feb 23, 1963. Tan said numerous changes had been made to the many safeguards of the state’s rights since it signed the Malaysia Agreement in 1963, affecting issues such as religious freedom, immigration control, the special position of Sarawak natives, state ownership over natural resources, the use of English as the official language of the state and education. Tan also made clear that an online petition, in which many have claimed to have supported, was not opened by them. Tan thus urged members of the public to personally come forward to pen their signatures at various booths set up across Kuching, Serian and Samarahan. “Go to the official booths to pen your signatures. The public can recognise us with our petition working ID card. “We will create an online petition site in due time to allow Sarawakians living outside Sarawak and Malaysia to support the referendum,” he said. Two weeks from now, he added, the group was planning to go into the rural areas and villages to promote their mission and collect more signatures. At the end of the campaign, Tan said the petition would be handed over to Chief Minister Datuk Patinggi Tan Sri Adenan Satem for further action. “We will continue to pursue our mission in other ways even if we fail to gather 300,000 signatures by end of the year,” he said. The various signature collection points are at the mooncake festivals sites at Batu Kawah old bazaar and Carpenter Street, Hui Sing (weekend only from 10am to 5pm), Premier 101 (daily from 7.30pm to 11pm), eMart in Matang, Ang Cheng Ho (QZ Cafe on Sunday 9am to 5pm only), the big food court at Samarindah in Muara Tuang (daily from 7pm to 10pm) as well as Serian, Mile 17 and Sri Aman. To my fellow Borneans in Sabah & Sarawak. As a Bornean living oversea, I appeal to all to know this that it will be better to be an independent country rather then to be part of Malaysia. Strongly voice this issue to the United Nations & the Commonwealth of Nations. Remaining in Malaysia means Sabah & Sarawak will always remain undevelop come what may. Singapore was kicked out of Malaysia and is today a developed nation. If we continue to be part of Malaysia, we will never progress and the Malayans will always call us orang hutan cos they consider Borneans as stupid. Let it be known that in the diaspora there are Borneans who are smarter than Malayans. These oversea Borneans is willing to return when independence is given to Sabah & Sarawak.